Pocket parks are small, active public spaces created in the existing public right-of-way. They can be located in medians, curb extensions, or in the furnishings zone on sufficiently wide sidewalks. In addition to landscaping, pocket parks may include seating areas, play areas, community garden space, or other elements to encourage active use of the public open space. Pocket parks provide important public space in areas with high-density land use and areas deficient in open space. Pocket parks may be installed by community groups where existing roadway space allows, or as part of a larger sidewalk or median widening initiatives as part of new development of the City’s capital planning efforts. Seating and other amenities may require additional permits from DPW, such as a Minor Sidewalk Encroachment Permit or Café Tables & Chairs Permit. See also Street Trees and Sidewalk Landscaping for permit requirements for those features. Pocket parks should provide a variety of open space functions including active and social activities, in addition to ornamental functions. Pocket parks may include seating, café tables, play or fitness equipment, open lawn space, dog runs, community gardens, ecological/educational displays, and community bulletin boards. Pocket parks should be landscaped or use special paving materials to differentiate their unique open space function from the normal sidewalk or median. A landscaped or constructed edge should be included at the edge of the pocket park to create a buffer from passing vehicular traffic. The buffer may be landscaped, such as a hedge, or constructed, such as bollards, a low fence, or a low wall (with integrated seating). The buffer should generally not be higher than 30 inches. Pocket parks may be designed to serve as stormwater retention and infiltration areas. Pocket parks should be terraced along steep streets to maintain ADA access and provide seating areas. Sidewalk pocket parks should be a minimum of 15 feet long and ideally at least 20 feet wide. Specific dimensions should be determined based on the width of the public right-of-way, space between driveways, and the needs of the surrounding neighborhood. Where on-street parking is provided, a 2 foot minimum vehicle egress area (courtesy strip), and a 4 foot accessible pathway or other accessible route should be provided, centered upon each parking space to allow access to parked cars to the sidewalk. Median pocket parks should connect to the primary pedestrian network through marked crossings at each end and, on long blocks, at a mid-block crossing. Bollards should be provided at the ends of the median to define the edges of the park space and create a formalized, special entrance. Median pocket parks should exceed these minimum guidelines as width allows for the setting and intended use of the space. A more flexible approach to the edge of the median can be taken on streets with low traffic volumes and speeds, where a lesser buffer may be necessary. In these cases, special design and paving treatments may be continued through the roadway to emphasize the pedestrian-oriented nature of the space. In many locations, historic development patterns and the intersection of street grids result in excessive but unusable pavement spaces (called “pork chops” to describe a common shape). Similarly, many city streets are designed for more traffic than actually uses them. These excess paved areas provide many opportunities for pedestrian improvements, landscaping, and active public space. Pork chops and unused intersection spaces should be brought to sidewalk level and should include landscaping, seating, and active uses. These spaces can be used to create bosques, rain gardens, paving treatments, public art, and other creative designs. A 7 foot corner or mid-block curb extension can provide space for seating areas; at corner curb extensions, a 5 foot clear zone from the corner curb return area is required for pedestrian access to crosswalks. 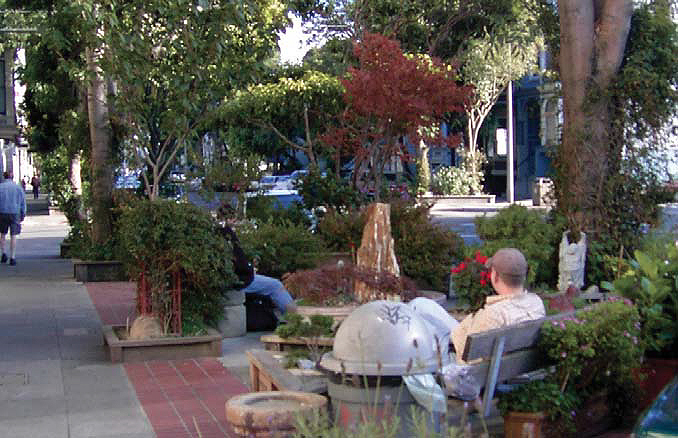 The Duboce Triangle neighborhood includes a number of small sidewalk pocket parks. With some exceptions, fronting property owners are responsible for the on-going maintenance and upkeep of sidewalk paving as well as all sidewalk elements directly fronting their property, such as trees, landscaping, and streetscape furnishings. Generally, the City is responsible to maintain roadway paving and other features in the roadway, such as medians. For community-sponsored pocket parks, the permit holder is responsible for maintenance of street improvements. Specific maintenance requirements will be described in your permit. Additionally, the permit holder is also liable for the improvements, and may be required to submit and maintain an insurance policy to cover liability, with the City & County named as additional insured.